The taboo of college coaches making the jump directly to the NHL is slowly sliding away. It's probably overdue. It's been common for years in the NFL and NBA for college coaches to get a chance, even though the results at times have been middling at best, with coaches such as Nick Saban and John Calipari clearly better off in college. But others, such as Pete Carroll and Brad Stevens, have been successful in both. In hockey, however, a college coach has been a college coach and an NHL coach has been an NHL coach, and rarely the twain shall meet. Only Ned Harkness (1970, Cornell to Detroit) and Bob Johnson (1982, Wisconsin to Calgary) had made the move until the last four years, when three coaches have joined players in graduating to the pros. Dave Hakstol went from North Dakota to Philadelphia in 2015, and two newbies joined the NHL this season: David Quinn moving from Boston University to the New York Rangers and Jim Montgomery going from the University of Denver to the Dallas Stars. Who could be next? The Frozen Four in Buffalo has showcased perhaps the top candidate in Providence's Nate Leaman, considered one of the college game's top tacticians. "It's great for our game, the number of players and coaches that are moving on to the next level," Leaman, 46, said this week. "I think the players are the ones that open the door, though. When a third of the players in your league are coming from 60 teams, then I think that is what has brought a lot of attention to our game." According to CollegeHockey Inc., 33 percent of NHL players this season took part in college hockey, up from 30 percent in 2015 and 21 percent in 2003, the last time the Frozen Four was in Buffalo. 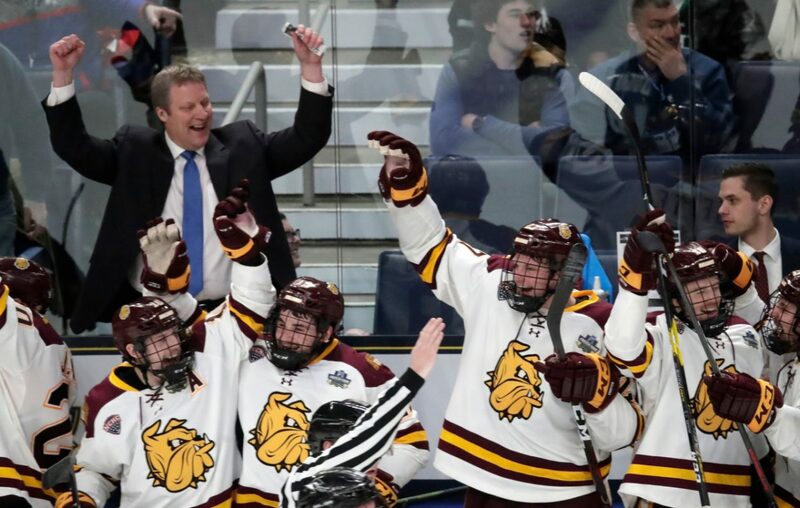 Minnesota Duluth's Scott Sandelin has been at his school for 19 years and will be coaching in his third consecutive national championship game Saturday night. Even though he's 54 and probably pushing the age boundary for an NHL rookie coach, there were plenty of rumors the Minnesota Wild might consider him if they had an opening this spring. That won't happen as the Wild announced this week they have decided to keep Bruce Boudreau. Nonetheless, Sandelin was asked by a national reporter after Thursday's win against Providence how much the NHL was on his radar. "At this minute right now, all I'm worried about is who we're playing on Saturday," Sandelin said. "You know what? I have a great job. If someday that ever pops up, I'll look at it, for sure. Right now, I'm in a great situation. I've got a great group of players. We're playing for a national championship on Saturday." It's no secret that Sabres General Manager Jason Botterill loves college hockey. In a normal year, with an open coaching position, Leaman would be a good bet to be high on his list of candidates to replace Phil Housley. The Sabres, however, seem locked into finding an experienced NHL head coach after the Housley years went awry, and that's probably the right call. Still, it's another example of how NHL retreads can make it difficult for college coaches to advance. College hockey players have long been attractive to NHL teams since the 1980 Miracle on Ice team at the Lake Placid Olympics, but a long-held belief has existed that the college game was too different a sport to allow for an easy coaching transition. But when the NHL took away the center red line after the 2005 lockout — matching the rule of the college game — one excuse for front offices was taken away. The breakthrough finally started with Hakstol, who had one playoff team in Philly but was generally regarded as stiff and distant until he was fired early this season. Early returns are much better on Montgomery, who has Dallas in the playoffs, and Quinn, who is a central figure in the Rangers' rebuild. "It further legitimizes NCAA hockey," said Denver coach David Carle, 29, who moved up from an assistant's role to replace Montgomery. "I think our players have been doing it for a long time. ... It only makes sense that the coaches start to get an opportunity to coach so many of the players that have come through the NCAA system. I don't think there's any doubt the numbers are going to continue to grow." Quinn coached Boston University to the 2015 championship game, where it lost to Leaman's Providence club. Quinn's top players that season included Sabres forwards Jack Eichel and Evan Rodrigues. "He cares about you a lot as a hockey player, but I think he cares more about you as a person, and as players you appreciate that," Eichel said in October before the Sabres' first meeting with the Rangers. "I think that's sort of what we took from him. He was really good at that." "He was very real with you and honest," added Rodrigues. "He told you when you needed to improve, but he also let you know when you were doing things right. He let us play the game, he let us make mistakes. When you're that age, you have to learn from those mistakes, but you have to make them to improve." Quinn's first season in New York was a difficult one at times as the Rangers traded veterans at the deadline while keeping 37-year-old goaltender Henrik Lundqvist. But the Rangers were close this season, with an NHL-high 14 losses in overtime or shootouts, and they will be adding the No. 2 pick at the draft after getting good fortune in this week's lottery. In addition to Eichel and Rodrigues, Quinn coached Boston's Charlie McAvoy, Ottawa's Brady Tkachuk and Minnesota's Jordan Greenway at Boston U. Scouts are always at college games, and they're not always charting just the players. "There's not a game that you play at this level, at least in our league, where there's not five or six scouts in your stands," Leaman said. "The scouts, they like the players, they bring in the assistant general managers. The assistant general managers like the players, they bring in the general managers. So those guys are getting a more focused look at our game." Hakstol had a good early run in Philadelphia before his reign fizzled out. But he wasn't helped much by a stubborn GM in Ron Hextall and the Flyers' goaltending issues weren't figured out until prospect Carter Hart was called up from the AHL after Hakstol was gone. Quinn and Montgomery seem to be the ones who can continue to make college coaches attractive if their teams stay on the rise. "If those guys continue to do a good job, it will open more doors for college coaches," Leaman said. "It's a really good game. I think the players are what's drawing the GMs, and that opens the lens to all of a sudden they're watching the game and seeing many things that may relate to the NHL."